Junior Suite at Emerald Hotel**** in Istanbul are sold for 14 € for the night of 9 October 2016. This is a tenth of the price these suites regularyl sell for. It's better to book the prepaid non-refundable room, so that there are better chances that the hotel or travel agent do not try to cancel the reservation. Flexible rates (pay at hotel) are also available for booking. Close to Austria's seat of power, this 5-star hotel is perfectly situated for those wishing to explore Vienna. Visit the nearby museums and the State Opera House on foot, or venture further with easy access to the metro. Dine in the stylish on-site restaurant, serving Austrian classics. For business use, the hotel's two meeting rooms can accommodate up to 40 delegates. Rooms all have complimentary wi-fi, flatscreen TVs with international channels, minibars and air conditioning. Whether on business or pleasure, you'll be ideally situated when staying at this stylish 4-star hotel. Spend hours browsing though the many shops along Mariahilfer Straße, dine at one of the small family establishments around the Naschmarkt, catch a show at the State Opera or pay a visit to the city's museum quarter, all of which can be easily reached from the hotel. After a busy day, relax with a meal or a drink in the restaurant and bar, and make use of the free wi-fi. This modern and stylish 4-star hotel is centrally located in Vienna, just a 10 min walk to famous Prater. Its facilities include a sauna, a fitness centre and an old-school cocktail bar. All rooms are equipped with free Wi-Fi, flat screen TV with free Sky channels, mini bar and air conditioning. Close to Vienna City Hall on Rathausplatz Square in the centre of the city, this hotel is conveniently near to Vienna’s best museums, shops, bars and restaurants. Packed with charming features and homely touches, there’s a gym, sauna and spa at the neighbouring sister hotel, high-tech meeting and event facilities on site, and all apartments are contemporary, cosy and perfect for relaxing in, with fully equipped kitchens, flatscreen satellite TVs and free wi-fi. This modern 4-star hotel in Vienna’s historic Leopoldstadt district, a short walk from the banks of the Danube, has a restaurant, a sauna and a bar with a terrace, and welcomes pets. All rooms have free wi-fi, a minibar, a flatscreen TV with a radio and a choice of pillows; suites have a separate lounge. The hotel prides itself on its buffet breakfast, which includes freshly baked croissants, organic muesli, regional specialities and more; dairy and gluten-free products are available. Close to Belvedere Palace, this four-star art-nouveau hotel features a sauna, steam room and fitness centre onsite as well as free wifi throughout. Rooms include air con, satellite TV and modern ensuite bathrooms. Moments from Vienna’s historic city centre, this 4-star hotel occupies a central position within the city. In a chateau style building with a modern interior, enjoy air conditioned rooms and free wi-fi as well as complimentary use of the sauna and fitness area. Unwind in Hotel Nestroy Wien’s winter garden bar or enjoy a movie in the comfort of your room. The cosy bar in the glass roofed winter garden provides an relaxing atmosphere in the centre of the city. This 4 star hotel is situated in a quiet, central district. Easy access by public means of transports, close to a metro station. Just a few minutes´walk from the the ideal base from which to explore Vienna´s many sights such as St. Stephen´s Cathedral or Schönbrunn palace. This hotel is the ideal base for your stay in Vienna, whether you are on a personal or business trip. We offer "all services under one roof", 2 restaurants, Relax area, shops and perfect infrastructure in the surroundings. This modern 4-star hotel is located on one of Vienna’s most popular shopping streets, with convenient transport links nearby. Rooms include air con, free wifi and satellite TVs, as well as an ensuite and kitchen facilities including a fridge and microwave. The hotel serves a buffet breakfast each morning, but is otherwise a self-catering hotel. Guests can make use of the fitness centre, including the sauna. The deal is for double rooms at the Soho Boutique Hotel**** for the night of 3 August 2016. We are talking about a 60% discount: rooms are sold for € 44 (breakfast included, free cancellation), as opposed to the booking.com price of € 102. Do share this deal with your friends. Anantara is a chain of 35 luxury hotels in exotic locations in Asia, the Middle East, the Indian Ocean and Africa. 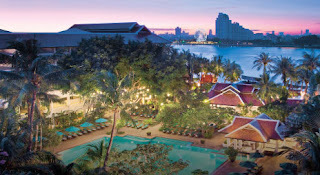 For stays of three nights or more at their property in Bangkok, Thailand you get 35% discount (compared to the best flexible rate). This is a good deal, as for a stay of 3 nights it basically means that you pay only 2 and the third night is free. These special rates are non-refundable. A new deal from HRS, the largest German-based online travel agency. Until 31 May, you can book double rooms at the 4-star hotel Le Cheminèe for only 35 € per night, breakfast included. Rooms at available for stays from mid-June to the end of August 2016. The hotel is located not far from the airport, offering a free shuttle. It can be used as a good base to explore both the city, but also the surrounding region (like the Vesuvium volcano or the famous Pompeii and Herculaneum destroyed by the eruption more than two thousand years ago). This family-run hotel is situated a stone's throw from the main train station, in the centre of the Rhein Main area. Ideal choice for travelers coming to Frankfurt by train and also convenient for those flying to and from Frankfurt. After a tiring day you can relax in hotel's wellness centre (4,50 € per person) with a stunning view over the city. This TripAdvisor Certificate of Excellence winner is a modern 4-star hotel set just 15 minutes outside Frankfurt city centre, a 10-minute drive from the airport and close to major trade-fair sites and the Commerzbank-Arena. You'll be able to enjoy seasonal produce in the hotel bistro, relax in the bar or on the outdoor terrace and make use of the free wi-fi in public areas. With seven meeting rooms capable of holding up to 96 people, this hotel is also perfect for those travelling on business. This 5-star hotel is close to excellent public transport links, as well as the cultural attractions of Frankfurt’s Museum Embankment. During your stay you can relax in the spa, enjoy fine dining in the restaurant or unwind in the bar. The hotel’s contemporary-style rooms have free wi-fi access, interactive TVs and private bathrooms stocked with luxury products. This modern, 4-star hotel sits in the city centre, only a short walk the Senckenberg Museum and Frankfurt Messe Fair. Nearby public transport gives you easy access to Frankfurt Airport. The hotel offers free wifi, 24-hour reception, a restaurant and bar. Meanwhile, each stylish room has soundproofing, a flat-screen TV, coffee maker, fridge, free wifi, and en-suite bathroom with free designer toiletries. This popular hotel is right at Dusseldorf International Airport. Dusseldorf city centre is just a 12-min drive by train. The hotel's facilities include free Wi-Fi, a wellness area with pool, sauna, steam bath, fitness room and massage service, 3 bars, and 3 restaurants serving international and regional specialities. The smart, modern rooms feature free Wi-Fi, satellite TVs, and mini-bars. If you want to look at Düsseldorf's finest shopping street Koenigsallee this hotel is perfect for you. The hotel is located in a quiet side street to the Koenigsallee. You can use the gym next door free of charge. Wifi is included. All rooms come with a flat screen TV and minibar. The location of this recently renovated hotel is perfect. You reach the next s-bahn station within a 3-min walk. From there it's only a 6-min drive to central station and fairground. You can enjoy free use of the gym, steam room and access to the sauna. Internet is free of charge. All rooms come with air conditioning and a private bathroom for your comfort, as well as tea and coffee making facilities. Start your day at the rich breakfast buffet. This 4-star hotel is within walking distance of Dusseldorf’s scenic Südpark and is well connected to everything the city has to offer by local public transport links. The hotel has a bar, and you can stay connected with its free wi-fi access. Rooms are furnished in a classic style, and feature air conditioning, minibars and cable TV. This modern 4 star hotel, sits just outside the town centre, close to several transport links, making it easy to explore the city. The rooms come with private bathrooms, air-conditioning and a minibar, and there’s free wifi access throughout the hotel. The hotel also has a restaurant and spa onsite. This 4-star hotel is found in a former house in a suburb to the east of Cologne, close to the E40, and the u-bahn. On-site parking for 2 euros makes it easy to get around, and you can make the most of your stay with the 24-hour reception service, take advantage of the free wi-fi and relax in the bar. Rooms are decorated in a modern style, with flat-screen TVs with satellite channels and private bathrooms coming as standard. This modern, 4-star hotel is situated in the Rheinauhafen district of Cologne city centre, close to the Rhine River. Its facilities include a bar specialising in cocktails, and a sauna, a steam room, and a gym. The air-conditioned rooms are decorated in a contemporary style and feature free wifi and modern bathrooms. This stylish 4 star property is conveniently located in central Cologne, near public transport links and close to the famous cathedral. The large rooms have a modern design and offer satellite TV, minibar and soundproof windows. Among the convenient facilities you’ll find on-site are an attractive bar and gym. This modern 4-star hotel is located on the bank of the River Rhine. All bright, spacious rooms have a flat-screen TV, minibar and tea/coffee facilities. Many feature ceiling-high windows and stylish wall art. Please note that dogs are welcome, for an extra fee (10,00 € per day). This modern 4-star hotel can be found near Cologne's picturesque Stadtbahn Mediapark, a short walk from Hansaring Station. With a wide-ranging menu, the hotel restaurant serves both excellent breakfasts to start off the day and delicious dinners to end the night. Each room is a comfortable space to relax, with seating areas and pillow menus as well as complimentary wifi to keep in touch with the outside world. This historic 5-star hotel offers a luxurious stay in Dubrovnik, just a short walk from the old town. The hotel offers its guests a private beach area, as well as an outdoor pool so you can relax and soak up the sun. The restaurant serves meals throughout the day and there's a spa and gym to unwind in. The elegantly decorated rooms come with air conditioning and a private bathroom for your comfort, as well as satellite TV and free wifi. A stunning location combined to a peerless elegance and a Mediterranean charme make this gem one of the most beautiful hotels in the world. Do not miss the hotel's outstanding service, its special atmosphere and its personal touch. This luxury five-star hotel is situated just a few steps from the UNESCO Dubrovnik Old town, overlooking the Adriatic Sea. This modern hotel is found in the heart of Nice, within walking distance of the Old Town and close to public transport links. Among the comfortable features the hotel offers are free Wi-Fi, a children’s playground, a lounge bar and a restaurant which serves local flavours and a breakfast buffet, as well as an attractive open-air pool. Rooms have flat-screen TVs and safety boxes. Conveniently close to Nice airport, this modern 4-star hotel is a great place to relax before or after catching a flight. Soak up the riviera sun in the outdoor pool, unwind in the spa with a fitness room, sauna and hammam and enjoy delicious local flavours in the hotel's restaurants. The colorful rooms are fitted with flat screen TVs with satellite channels, free wifi access, air conditioning and private bathrooms. Within walking distance of Nice’s old town, this modern 4-star hotel is perfectly placed to experience this beautiful city. During your stay you can unwind in the hotel's gym, spa and sauna, take a dip in the outdoor pool and enjoy delicious breakfasts and local cuisine in the on-site restaurant. The stylish rooms have en suite bathrooms with complimentary toiletries, as well as free wifi, a flat-screen TV and air conditioning. Located just outside Nice's city centre, with convenient tram links for seeing the sights, this contermporary 4-star aparthotel is a great place for a relaxing stay. Unwind in the on-site spa facilities, including a sauna and steam room, or take a swim under the sun in the hotel’s outdoor pool. The bright en suite rooms are real homes away from home with kitchenettes, living rooms with satellite TV and free wifi access. Overlooking the Albert Gardens, with views of the Promenade de Anglais, this 4-star hotel is the ideal base for discovering Nice's coastline and Old Town. A full continental breakfast is served each morning in the breakfast room. Wi-fi is available in the lobby, and rooms come with wired internet access, air conditioning, a minibar and a flatscreen TV. Suites offer balconies overlooking the gardens and the Mediterranean Sea. The hotel has four meeting rooms accommodating up to 250 guests. This eco-friendly four-star hotel is close to the Prom des Anglais beachfront and includes a rooftop pool. Rooms include flat-screen TVs, iPod docks and an ensuite with complimentary organic toiletries. This modern 4-star hotel sits in central Lyon, close to great transport links, making it easy to explore the city. Enjoy a buffet breakfast or dinner at the restaurant, grab a drink at the bar or relax out on the terrace. The elegant en suite rooms all come with free wifi access, air conditioning and a flat screen TV. This modern 4-star hotel in central Hamburg, with nearby public transport links, is an ideal base from which to explore the city. It’s only a short walk to the restaurants and shops in the lively Karolinenviertel and Schanzenviertel quarters. You can start your day with a buffet breakfast and end it with a cocktail at the trendy hotel bar. There’s also chance to unwind at the hotel’s sauna and out on the sun terrace. Sitting on the banks of Lake Outer Alster, this 5-star hotel first opened its doors over a century ago and has played host to some of Hamburg's finest ever since. Dine in the hotel's formal dining room, famed for its classical dishes, or have a lighter meal in the bar, with its lovely Art Deco surroundings. The hotel has 13 conference rooms, with beautifully ornate original features. Rooms have mini bars, Nespresso coffee machines, complimentary wi-fi, flatscreen TVs and iPod docking stations. Book a room at this modern 4-star hotel with its contemporary décor, and you'll find yourself next to one of the city's main shopping areas. Within easy walking distance of the AVE train station you are ideally placed to explore the best that Andalucía's historic capital has to offer. San Pablo Airport is also a mere 15-minute drive away. Take time out for a meal at the hotel's on-site restaurant, relax in the bar or meet up with a personal trainer in the gym. Close to the Macarena Basilica and Seville's cathedral, this 4-star hotel is a great base for those in the city with sightseeing in-mind. The hotel is housed within a classically Spanish five-storey building. Dine in either of the two restaurants, serving Japanese and Mediterranean cuisine. Alternatively try a snack in the Sports Bar. The hotel has eight meeting rooms, with a capacity of up to 600 guests. Rooms come with complimentary wi-fi, a flatscreen TV, minibar and air conditioning. This monolithic 4-star hotel sits in the centre of Seville, within easy walking distance of the city's sights, including the Fine Arts Museum and the cathedral. Dine on the terrace at the hotel's Mediterranean-themed on-site restaurant and have a drink in the Café Bar. Swim in the outdoor pool, perched on the roof of the hotel. The hotel's 262 rooms all have access to wi-fi, a flatscreen TV and air conditioning. For those on business the hotel has five meeting and event rooms. Situated a stone’s throw from the Cathedral of Seville, Moorish Giralda Tower and the world famous Plaza de Toros bullring, this 4-star, converted 18th-century former palatial home is within the bustling Barrio del Arenal neighbourhood. Walk along its winding, cobbled streets to find great dining options in the area surrounding the hotel or choose to visit the restaurant or tapas bar on site. Seville's San Pablo Airport is only 12km from the hotel. Soak up the incredible atmosphere of central Florence when you stay at this historic 4-star hotel nestled in the heart of the city. Set in a stunning 12th- century building, the hotel is just minutes from major attractions such as Florence's cathedral, the Uffizi art gallery, Ponte Vecchio and Piazza della Signoria. A multitude of shops, restaurants and cafés are all within a few feet. Free wi-fi is available throughout the hotel and there's also meeting spaces and a bar on the ground floor. Nestled among luxury boutiques and busy piazzas, this elegant 5-star hotel reflects Florence's beauty with its antique furniture and 19th-century charm. You'll be just a few minutes' walk away from major sights including the city's cathedral with its dome by Brunelleschi, the Uffizi art gallery and Ponte Vecchio, along with transport hubs such as Firenze Santa Maria Novella railway station. Enjoy a relaxing cocktail in the hotel bar before heading to the restaurant to sample Tuscan fine dining. Set in gorgeous surroundings just a short walk from the cathedral in the heart of Florence, this beautiful 4-star hotel is a luxurious city retreat. This TripAdvisor Certificate of Excellence winner is full of character and packed with great modern touches. On site, there’s a gym, an American bar, parking at a discounted rate, and free bicycles are available to explore the city on. All rooms are comfortable and traditionally styled, with satellite TVs, wi-fi access and air conditioning. Built within a 17th-century Florentine palace, this 4-star hotel is full of charm. The hotel is located close to some of Florence's most famous landmarks, including the Duomo and the Basilica of Santa Maria Novella. Dine in Il Michelangelo bar and restaurant, which serves delicious Tuscan fare throughout the day, and offers a wide selection of national and international wines. Air-conditioned rooms come with a flatscreen TV, complimentary wi-fi and minibar. Exclusive Villa located just 10 minutes drive from downtown Florence. It provides first class amenities, excellent service, a restaurant with tasty cuisine and free shuttle to and from the center of Florence (scheduled times). Don't miss the opportunity to have a memorable stay in Florence! Hotel Kungstradgarden**** is a 4-star hotel opened in 2015 in a renovated 18th century property. The hotel is centrally located and offers free breakfast and free Wi-Fi. The rate is valid only for 1 night (Sunday, 18 September 2016) for single occupancy of a king room. Let us know how this deal worked for you. Remember that some hotels might try to retract from the quoted rate. Otel.com definitely is one of our top 10 online travel agencies. They currently offer a 7% discount on hotels. The best part is that this code applies also to big chain hotels. HRS, the largest German-based online travel agency offers good deals at a handful of hotels each week. This time, you can book rooms at the modern 3-star hotel Westlodge Dardilly Lyon Nord for only 45 € per night, breakfast included, on selected dates at the beginning of this summer: last week-end of May and first week-end of June and the second half of July 2016. The hotels also offers free parking and free Wi-Fi. It's location make it well-suited either for a visit of the UNESCO listed city of Lyon, or just a stopover on your way towards the South of France. The deal is available for booking only until 27 May. Rates are non-refundable. The more you stay, the more you are rewarded with bonus points under the current Club Carlson promotion. The promotion is valid at all Club Carlson properties worldwide (Radisson Blu, Radisson, Park Plaza, Park Inn by Radisson, Country Inns & Suites By Carlson and Quorvus Collection). - more 25 000 nights when reaching at least 15 nights stayed until 31 July 2016. The points above are cumulative, so for a total of 5 nights you get a total of 15 000 points and for a total of 10 nights you get a total of 25 000 bonus points. Stayed nights do NOT need to be consecutive. TravelPony is one of the last remaining authentic discounters of hotel rooms. Today they run a flash sale offering a 10% discount on TravelPony rooms.